Starting tomorrow, March 21, Deus Ex: Mankind Divided, the 2016 Deus Ex sequel, and indie darling What Remains of Edith Finch will be added to the Game Pass library. 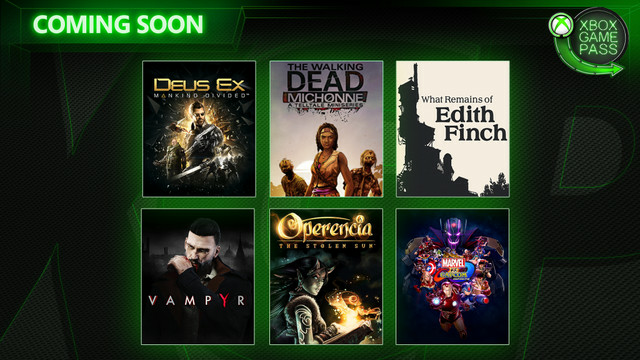 On March 28, Telltale Games miniseries, The Walking Dead: Michonne, and action RPG Vampyr will arrive on Game Pass, followed by dungeon crawler RPG, Operencia: The Stolen Sun on March 29. Finally, on April 1, fighting game Marvel vs. Capcom Infinite joins the fray. And Microsoft revealed in an Inside Xbox livestream last week that Minecraft will be added to the service on April 4. They join the titles added to Game Pass earlier this month, Just Cause 4, Fallout 4, F1 2019 and Lego Batman 2, as well as over 200 more rotating Xbox One games. The service costs $9.99 per month, but Microsoft is currently offering new subscribers their first month of Game Pass for $1.